We're joining Doctor Who this week towards the tail end of Peter Davison's first season as the Fifth Doctor. If you've been following along with my previous TV Club writeups, the main cast here is the same as in Davison's debut, "Castrovalva": The youthful but fatherly Doctor, irritable air hostess Tegan (Janet Fielding), passive science wiz Nyssa (Sarah Sutton), and boy genius Adric (Matthew Waterhouse). There is plenty to like in "Earthshock," led by the always-engaging Davison's performance and tension-building direction by Peter Grimwade that draws out the best of the adventure-story aspects of Eric Saward's script. There's plenty also that doesn't work, some rooted in Saward's script, some systemic things that the series as a whole struggled with at the time—a superficial focus on nostalgia and shock, poor characterizations, and slack plotting. "Earthshock" was notable at the time for the surprise return of the implacable robotic Cybermen, who had been mainstay villains during the Patrick Troughton years but had only made one other appearance after 1968, in 1975's underwhelming "Revenge of the Cybermen." But the major reason why "Earthshock" has such a major place in the history of Who today is a surprise disappearance: The death of Adric. Cast changes were nothing new, of course. The TARDIS might as well have had a revolving door, since almost every previous season had seen a major character leave or another join, and more than once a total overhaul of the whole series. But the killing-off of a major character was something else. As sophisticated as Doctor Who tried to be, it was also still in part a kid's show, with a big fanbase of children and pressure on the producers not to alienate them, or their parents, with material deemed too intense for them. So Adric's death was a game-changer. You just didn't do that on Doctor Who back then. Oh, sure, a couple of the Doctor's companions had been killed off in the William Hartnell days, but honestly, to call them full-fledged companions is almost cheating: One had only joined the TARDIS crew in the previous story, and the other never actually met the Doctor at all. Adric's death was the first time that a familiar character who'd been with the Doctor for a relatively long time got the axe. Producer John Nathan-Turner had a penchant for goosing publicity with stunt casting and shock-driven twists that weren't always motivated by solid dramatic reasons, and although Adric's death was certainly an example of that kind of superficial calculation, it had some good reasoning behind it as well. First, the production team was keen to show that this Doctor was not infallible and to give the series an increased sense of genuine threat, a necessary swerve after the Fourth Doctor's flippancy and casual arrogance in the face of cosmic menace had grown stale after seven years. And it worked: After Adric, the grimmer tone dominated in the Fifth Doctor era, with an increasingly murky grey morality (including two companions secretly working for his enemies) and a level of violence that bordered on the nihilistic. That was also in keeping with a broader strain of grimness in 1980s science fiction, from The Empire Strikes Back to the punk nihilism of 2000 AD. In its dark cave tunnels and starship corridors and "Earthshock" successfully captures the feeling of claustrophobic terror in Ridley Scott's Alien (and with its squadron of soldiers massacred by a superior inhuman force, uncannily anticipates Aliens, which came out four years later). Another reason to kill Adric: With four main cast members, there was often not enough for everyone to do, which led to a lot of watered-down storytelling. Of course, there have been four travelers on the TARDIS many other times, from the very beginning to the present day. All four characters don't always have to have a central role, and for obvious reasons "Earthshock" rightly puts its focus on the relationship between the Doctor and Adric. What really matters is whether all the characters have a chance to be involved in the ongoing storyline, and this is where the writers too often failed, with no exception here. Tegan gets to run around with soldiers and fight Cybermen, but Nyssa is ridiculously sidelined. If someone had to go, Adric was a popular choice. Waterhouse was, at least at the time, a very inexperienced actor, and that often showed. But Adric's personality was the real problem for a sizable number of fans—Adric the obnoxious teenage whiz kid was a walking nerd stereotype, which hit uncomfortably close to home for some and was just irritating to many others. 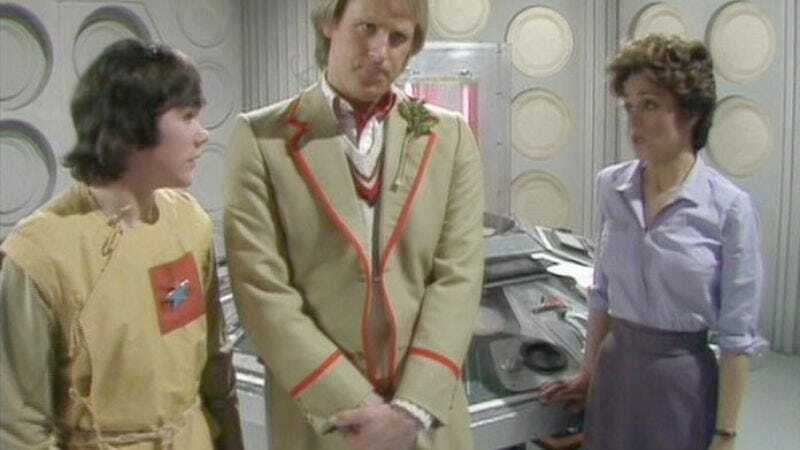 But given the trio of Tegan, Nyssa, and Adric, you could have pulled any one of them out and still have been able to tell any story you could have with all three. Nyssa and Adric were both young geniuses who had been traumatically separated from their families and essentially adopted by the Doctor, who felt responsible for them in a way he hadn't for hardly anyone since his granddaughter Susan, way back in the early days. Adric and Tegan were both rash risk-takers who could advance the plot by arguing with people and getting in over their heads—something the Fifth Doctor was far less likely to do than the impishly imperious Fourth. And the writers often struggled to juggle all that. For the most part, you could have had Nyssa take a nap for the entirety of "Earthshock" for all the effect she has on the story. Which is basically exactly what happens earlier in the season, in "Kinda." It's possible that Nyssa was actually a better choice to get rid of than Adric simply because the writers—led by script editor Saward—were almost comically inept when it came to finding things to do with her character. In the later episodes of "Earthshock," Nyssa is reduced to being left behind in the TARDIS with just a few brief scenes in which she essentially explains to the viewers that she's sitting this one out. But as I noted, "Earthshock" is mainly a show about the Doctor and Adric, and it's a pretty good sendoff for the kid. I particularly like that the aspects of Adric's personality that are most irritating—his adolescent petulance and his smug teenage insistence that he knows better than everyone else—are deliberately highlighted by his fight with the Doctor in the first episode, but not to the exclusion of his better qualities. There's quite a bit of earlier continuity that pops up in the course of the scene, but the important thing is that the emotional resonance is perfectly clear: Adric has a serious case of younger-brother syndrome, and wants a little more respect from his surrogate dad. His demand to go home is dangerously foolhardy and unrealistic, given that he's from a different universe, but it feels real to me, the way another teenager might insist to his parents that he can so make it big as a rock star and they never take his side and jeez, mom, I'm nearly 18. What saves Adric in this scene for me is not that he won the argument or got his math right over the Doctor's insistence it couldn't be done, it's that he was bluffing. He's not as naive as he seemed, maybe; he just wanted his family to notice him. Is that so wrong? While the TARDIS crew is dealing with domestic drama, the main plot is kicking off in the caverns where the TARDIS has landed, as a group of soldiers arrives with a female palaeontologist in tow to find out what happened to the previous expedition, all presumed dead. The first episode is almost a separate story from the latter three, which is only partly due to the presence of a placeholder villain to keep the surprise reveal of the Cybermen intact. One of the chief problems in "Earthshock" is that these two halves don't fit together very well, leaving the story with too many extraneous characters and a pair of Cybermen-driven plots that don't entirely make sense next to each other. That said, the cavern segment in particular is nicely tense and mysterious. The lighting is dim and shadowy, serving the dual purpose of creating a foreboding atmosphere and of giving us just enough of a look at the silent black mannequin-androids to make them sinister without giving away that they're just two actors in skintight bodysuits and full-head plastic helmets. They're far more terrifying than their nominal superiors (at least, when they're not well-lit), looming up out of the darkness to reduce their victims to smoking puddles. And while it's not exactly unusual for the Doctor to innocently show up right in the middle of some nastiness and have to charm his way into the trust of some rightfully suspicious people, "Earthshock" makes this familiar starting point dramatically effective, and quite different from the way previous Doctors would have breezed through it. There's a genuine sense here that Davison's calm, polite insistence that he's there to help might not be convincing this time. Luckily, the androids attack when the humans discover the metal hatchway in the cave wall they're there to protect, and their willingness to shoot at both the soldiers and the TARDIS crew solves the trust issue. For the moment, let's skip the Big Reveal at the end of the first episode, since the main characters don't get to find out who it is until later either, and move ahead to the opening of the hatchway which reveals, surprise and shock, a bomb. Defusing a ticking time bomb is such a standard plot device that it's hard to make it exciting or fresh, but it's worth noting how making the bomb remote-controlled turns what could have been a typical "cut the red wire—no, the yellow one!" scene into a much more tension-filled tug-of-war with an unseen opponent. When the action transfers to the space freighter where the Cybermen are hiding, the plot starts to bog down in its implausibilities and the fact that Saward has written himself more characters than he knows what to do with. It doesn't help either that many of the secondary characters are bland or unlikable or both, which was brought home to me when I realized toward the end of the last episode that Lt. Scott's name had completely escaped me and I'd been referring to him in my notes just as "Mustache Guy." Beryl Reid, deftly underplaying her role, is one of the few memorable standouts—she's surprisingly good considering that it was publicity-driven stunt casting on Nathan-Turner's part to hire a feisty, grandmotherly comedienne for a role conceived as a hardnosed, skinflint male freighter captain. Reid certainly fares better than Clare Clifford as the whiny scientist Kyle, who could have been used in the story to help make the time-shift back to the age of the dinosaurs seem like less of a left-field contrivance, but winds up stuck in the TARDIS with Nyssa, complaining and spouting hilariously obvious lines like "Robots! They're huge!" Contrast this with their new-series reappearance in "The Age of Steel/Rise of the Cybermen," which successfully shows them as both relentless mechanical army and creepy, cultlike zombie/Borg monsters, and even finds a way to make their unemotionality more frightening via the idea that although rigidly suppressed, Cybermen do have emotions—including endless horror about what's been done to make them Cybermen. "Earthshock" hits on several other iconic elements of previous Cybermen stories, including their tradition of working with a human traitor as an inside-man in their plots against Earth, their weakness to gold (a silly Achilles' heel invented in "Revenge"), and their penchant for smashing their way out of suspended animation, a reference to "Tomb of the Cybermen." But their vampiric tendencies were forgotten—or maybe deliberately ignored, since their stated goal here of destroying the Earth would be at odds with wanting to harvest the humans on it as an excellent source of future Cybermen. (They did try to blow up Voga in "Revenge," but that's because the entire planet was toxic to them.) But even though the bomb in the cave and the freighter full of sleeping Cybermen are both eventually revealed to be part of the same plan to disrupt an interstellar alliance against them, the two subplots seems weirdly disconnected, as if they were hammered together out of two unrelated scripts. Did they want to blow up the Earth with the bomb, or invade it with their hidden troops? Did I say they were emotionless? Well, no. Saward throws that aside starting from their first line, when the Cyberleader shouts in fury "Destroy them! Destroy them at once!" Maybe that would work if he'd been trying to show that they'd evolved in some new and more human direction since the last time we saw them. But as soon as the Doctor and the Cyberleader meet in person, they're trading jabs about whether it's better or not to have feelings, and to appreciate "the pleasure of smelling a flower, watching a sunset, eating a well-prepared meal." And to cap it off, Tegan is threatened with death specifically so the Cyberleader can try to show the Doctor how his emotions make him vulnerable. The truth is, the Cybermen here change between emotional or unemotional whenever it's convenient to the script. The only explanation is that Saward just couldn't be bothered to write them consistently. It's a waste of material, because if they were looking for a nostalgia-laden, previously established villain who hadn't been seen very often over the last few years, there was a perfect one for this story. If you need a group of militaristic, angry, sneaky aliens whose plans involve the destruction or subjugation of the Earth, and who have a personal enmity with the Doctor that's deep enough that they recognize him in multiple regenerations, and who have developed their own time-travel technology, then you're talking about the Daleks. (Even the Sontarans would have been a better fit.) It makes so much more sense for this to have been a Dalek story that from now on I think I'm just going to imagine that there was some comical mixup in the costume department, maybe all the Dalek shells were being dry-cleaned or something, and they just said, "Oh, what the hell, let's just use these silvery things over here." Midway through the final episode, "Earthshock" throws its one really weird curveball when, completely by accident, the freighter begins to travel backwards through time, setting up the twist ending that the Cybermen are actually responsible for the extinction of the dinosaurs. Unexpected time travel is a fair twist to throw into Doctor Who, of course, but it's the "by accident" part that's mind-boggling. How does that possibly work? 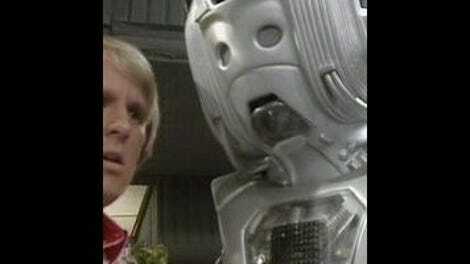 Adric's bit of technobabble suggests that it happened because of a bad interface between the Cybermen's computers and the freighter's guidance systems. Say what? OK, I can see where that might fry the control panel. Maybe even the ship blows up. But a jaunt back to the Mesozoic? That's like wiring your PC up to your Mac and having a volcano erupt in your living room. The only way this works is if the freighter was built using parts left over from Doc Brown's DeLorean. All this leads up to Adric's death scene, and like the father/son spat in episode one, it's a good showcase both of what made his character irritating and what made him endearing. That moment when he hops off the elevator, so sure that he's cracked the final code that he's willing to risk his life for it, is on the one hand a typically infuriating dumb decision, because we viewers know he doesn't even need to stop the freighter from crashing anymore. But Adric had no way of knowing that, which makes him in his self-sacrifice braver and better than either Captain Grandma or Mustache Guy, both of whom are arguably have a duty to stay with the ship to the bitter end. It's their planet. Adric's not even from this universe. • The Doctor's line when he leaves the TARDIS to explore the caverns, "I'm going outside now, I might be gone some time," is a bit of foreshadowing that death is in the air: They're the famous last words of Lawrence Oates, who sacrificed himself on Robert Scott's doomed Antarctic expedition by walking out into a blizzard so that his companions wouldn't be slowed down by taking care of him. • "That's what she said" alert: "I realize going down again must be … hard." • Next week: The First Doctor and his companions get a lesson in why history sometimes can't be changed in "The Aztecs"
• Oct. 2: "Terror of the Autons"
• Oct. 9: "The Talons of Weng-Chiang"
• Oct. 23: "The Dalek Invasion of Earth"
UPDATE: I'm getting even more out of chronological order than usual, filling in for Keith over in the new-series recaps for Matt Smith's "The Girl Who Waited" on Saturday, so the Classic schedule will bump back one week, moving "The Aztecs" to Sept. 18. Update to update: Make that Sept. 25. See you then.